Brrrr!! The cold snap all over North America is sending everyone under the covers, bundled up with a bowl of hot soup and a mug of tea. It’s nice to know that it’s not just Canada that’s freezing cold in the winters, but my friends down south are feeling the bite of the winter wind as well. Not that I’m relishing in your frigid weather, it’s just nice to know we’re not alone up here in the cold North. I’ve got a weather-appropriate bowl of butternut squash, carrot, and red lentil soup for you, and it’s full of warmth, both in colour and in flavour. There’s something so comforting about winter and soup. 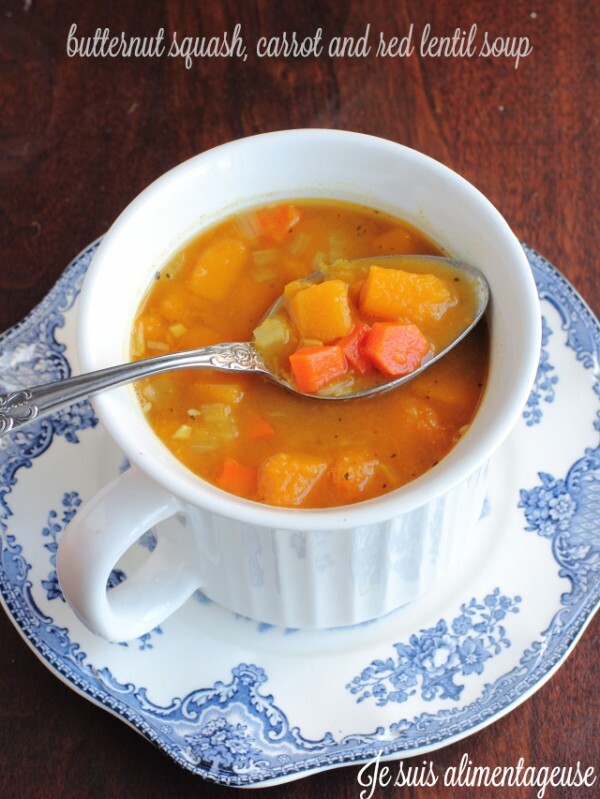 The butternut squash adds a nutty sweetness, the carrot adds that depth of root flavour, and the red lentil adds some texture with a punch of protein in the broth of onions and garlic. Add the tumeric-heavy curry powder, the mild zing of of ground ginger, and a hefty dash of paprika. This soup has the heat (not spicy heat, just actual thermal heat) to warm you up from the inside out. You’ll feel cozy and warm, as if you had friends and loved ones cuddled around you, reminiscing about your childhood or whispering little secrets and I-love-you’s here and there. Think of this soup as a savoury sweet kiss on your taste buds. The butternut squash soft and creamy; the carrots a little firmer but still tender. The lentils add a lingering texture that makes your soup go from broth and vegetables to a hearty soup. It’s a wonderful thing, a bowl of hot soup. Cradled in your hands, you close your eyes and inhale the brew of spices and herbs, letting the heat seep into your belly and into your bones. Spoonful after spoonful, until there’s only a drop or two left. The warmth settles under the covers before it dwindles through your exposed little toes at the edge of the blanket. I hope you stay warm this winter, and your kiddies are bundled with love and layers for school. See you on Saturday for a post about things I’ve discovered are not vegan that have changed my life (probably for the better). Over medium heat, cook chopped onion in olive oil until translucent (about 3 minutes). Add garlic cloves and continue to cook (about 2 minutes), stirring to keep garlic from burning. Add curry powder, paprika, ground ginger, garlic and onion powders and mix until it coats the onions. Work quickly to add the water/vegetable broth so that the spices don't burn. Add the bay leaves, butternut squash, carrot, and lentils and bring heat up to high until the soup starts to boil. Lower to medium heat once it starts to boil and let simmer, covered, for about 40 minutes. Stir occasionally until the carrots are tender. Turn off the heat, take out the bay leaves, stir in sesame seed oil and nutritional yeast, adding salt to taste.